If your old mattress is interfering with your sleep, or you’ve used the same mattress for 7 to 10 years, it’s time to consider a replacement. In the past, you probably had to decide whether an innerspring, memory foam or latex mattress best suited your needs. While all of these technologies are helpful, each has benefits and downsides for sleepers to deal with. 700 Series Coil Technology: Even if your partner moves during the night, these expertly constructed coils will prevent the motion transfer that disturbs your sleep. GelTouch™ Foam: The Beautysleep’s GelTouch Foam will not only provide pressure point relief throughout the night, it will also ensure that your sleep is cool and comfortable. Damask Fabric: This silky fabric will help keep you comfortable and cool throughout the night. Stretch-Knit Fabric: This special fabric will stretch to adapt to your body and sleeping position. 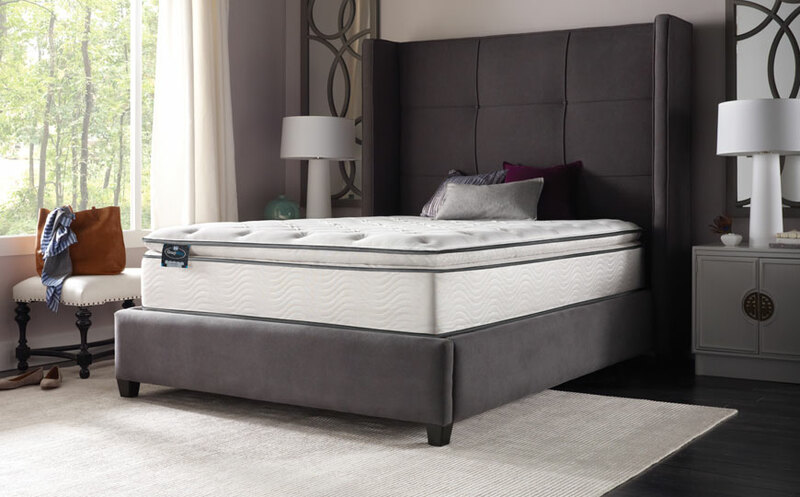 Foam Encased Edge Support System: The Beautysleep’s specially designed Edge Support System provides the support necessary to stretch out over the mattress without falling off. The friendly professionals at the Mattress Factory will gladly give you more information on the Simmons Beautysleep plush pillow-top mattress. Call now, or visit our showroom for more personal assistance. We can’t wait to hear how we can help you find your perfect night’s sleep!